Up early for a tour to Lantau island. Our company was Aussie, Irish and English – all pleasant. Our first stop we checked out one of their best beaches (never a good thing for an Aussie considering what we have at home) and then headed to the Tin O fishing village. We went for a ride on a boat through the village and then wandered around. It was markedly like those we visited in Vietnam, but there was a feel of more prosperity. Saw a Tao festival in action which was good. 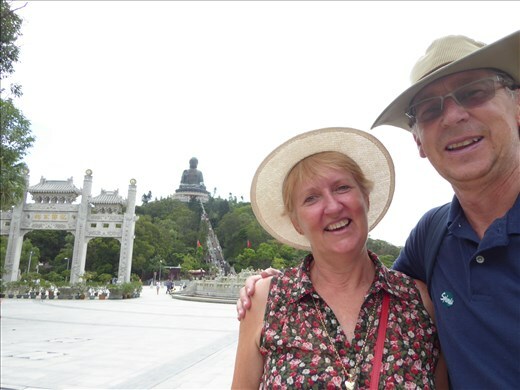 Then headed to the giant Buddha – the high point of the island for many of the Buddhist faith. The Buddha is 34m high and dominates the complex which includes a monastery. From there our mode of transport was a cable car back to the start point. It has a total length of 5.7km, it is the longest cableway system in Asia and has huge spans. Really great views and just amazing engineering. Note that they are also very good at bridges over here. Due to the nature of the land they need to connect the islands with huge and spectacular bridges. We caught the train back to Hong Kong island as the traffic at peak hour is ridiculous. Then a beer in a cute little bar before making use of the tram to head off to Tim Ho Wan, a Michelin hatted Dim Sum house for dinner. Was one of the things I really wanted to try before leaving so great that we could do a good one.